These days, if you want people to be able to run your game on a Mac you’ve got to digitally sign the thing or else most users will see the dreaded Gatekeeper dialog that claims the game is damaged and should be moved to the trash. All it means to digitally sign your game is that you’re using Apple tools to embed your Developer ID in it so that Gatekeeper will trust the thing. My buddy Rusty has a really straight-forward post about how to do this and how to test it to make sure it works. Read his post first. Ok, you’re back from reading it? Maybe you noticed he’s not talking about signing a Unity game, so I’m gonna fill in those details. For distribution outside of the Mac App Store you need to make sure you use Developer ID Application as the signing entity. When you hit the Update Build Pipeline button it will generate an entitlements file in your project and either create a PostprocessBuildPlayer script or append some code to the existing one. 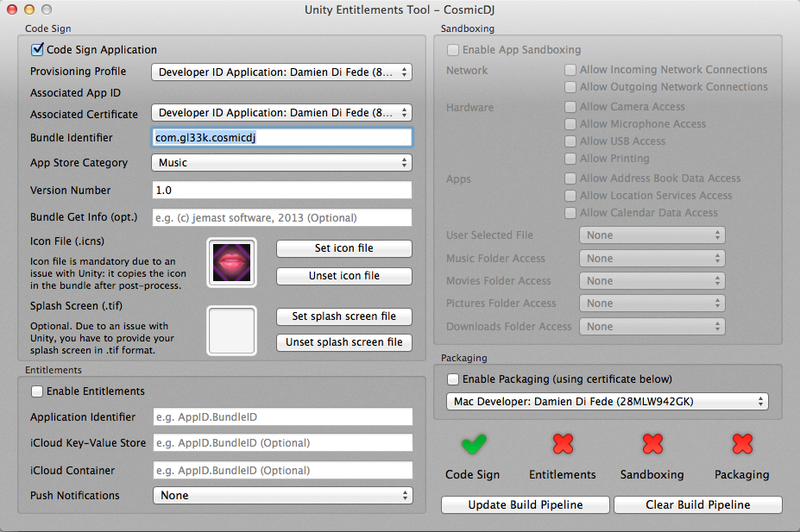 What this script does is explicitly sign all of the Unity framework DLLs and all of your Plugins. And then follow the “quarantine” steps: upload to a server or Google Drive or something, download to your computer, attempt to run. Here’s some fun trivia about Cosmic DJ: the way that we achieve our rock-solid musical timing and responsive tap input is by using an external audio engine that I wrote. Generally speaking I would not recommend doing this! However, it’s just not really possible to have perfect metronomic time if you are running your metronome in the main game loop. Fluctuations in frame rate mean fluctuations in the smallest timestep available to the metronome, so if a frame takes longer than a 16th note you’ll hear the rhythm get a little wonky! Anyway, that’s a separate discussion, I’m going to talk about all of the things I got caught on while trying to build this non-trivial plugin. Unity has a really simple example plugin in their documentation that I’d recommend simply copying all of the settings out of. It’s called Simplest Plugin and is linked under the Examples section of Build Plugins For Desktop Platforms in the Unity Manual. I suggest looking for this page in your local documentation, just to be safe. There are a couple other libraries included in the plugin that I wanted to statically link to, such as my own partial port of Minim to C++ (YMMV), and like you do I wanted to have a solution that included the vcproj for Minim as a sub-project. This turned out to be mostly problematic because of the very particular build settings required by Unity. I found it difficult to make sure all of my projects agreed in their settings and also linked together properly. Windows doesn’t have audio file reading routines built-in (like CoreAudio does in OSX for instance), so we leverage a couple open source libraries to make this happen (libsndfile and mpg123 if you must know). Both of these libraries are distributed such that you link against a .lib, but the real code lives in a DLL that is loaded at runtime. Unity can handle this but not quite in the way you’d expect. To work in the Editor: Any DLLs that your plugin depends on must be put in the top level of your Unity Project folder, not in Assets/Plugins as you might expect. To work in the Standalone Player: Any DLLs that your plugin depends on must be put in the same folder as the exe file, which either means copying them by hand or writing a post-process script to copy them. A cool thing: it’s possible to debug your plugin code in Visual Studio while the DLL runs in the Unity Editor. For your debug flavor you’ll want Runtime Library set to Multi-threaded debug (/MTd). With your project open in Visual Studio: start the Unity Editor, go to the Tools menu in Visual Studio and choose “Attach To Process…”, choose Unity.exe from the list (Visual Studio might hang out for a bit before becoming responsive again), set some breakpoints, and press Play on a scene in Unity that has a script that calls into your plugin. When you call into code that has a breakpoint, VS will catch it and you can inspect variables and do like you would normally do. Important: Unity won’t load your plugin until the first time a script calls out to it, so when you initially attach to the Unity process it’ll look like your breakpoints are inaccessible, which is true because the DLL hasn’t been pulled into the executable yet. Importantly, PtrToStringAnsi copies the string represented by the IntPtr and also expands characters to unicode, so now you’ve got a string that is made from managed memory and will not cause crashes when it goes away. Of course this means you definitely do not want to allocate a new string when you return one to Unity because that memory will be leaked. 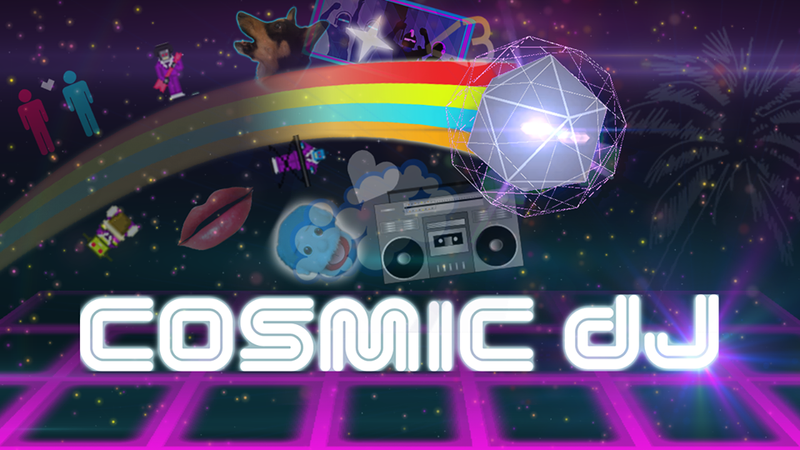 Cosmic DJ Released In Special Humble Bundle! Wow! So Excite! The music game I’ve been working on for the past two years with my buds Eric and Matt over at GL33k is now available for Windows and Mac through the Devolver Digital Double Debut Humble Bundle! This is pay-what-you-want bundle of games and movies. You can also choose to put some of your payment towards Brandon Boyer’s Cancer Treatment Relief Fund. He’s a super awesome dude that has been instrumental in bringing indie games the attention and respect they deserve and has been straight up stiffed by his insurance company because they are invoking a super dicey pre-existing condition decision. And there’s more to come: we will be releasing Cosmic DJ for iOS in the near future and hopefully bringing the game to Steam as well. I’ve also got a couple technical blog posts lined up about some of the stickier issues we encountered while preparing the desktop release. You can keep tabs on Cosmic DJ through Facebook and Twitter. Tell your friends!